Marvel at the sprawling South Island from the sky on this unique and thrilling sightseeing adventure. 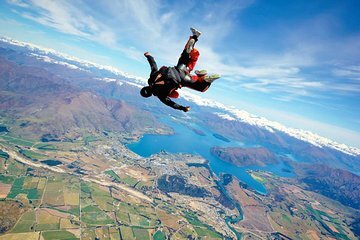 Perfect for beginners as well as experts, this skydiving experience will pair you with a certified Tandem Master, your partner for your dive above Wanaka. Take a scenic flight to the jump spot, then take the plunge and take in the landscape, including the rolling Southern Alps, the Twin Lakes and the mighty Clutha and Waiau Rivers.